You certainly distinguish yourself from the typical striptease artist and I hope I get the opportunity to see your act one day. Ever come to Victoria, BC? Any particular piece of music you perform this act too? What kind of response do you get from the audience? 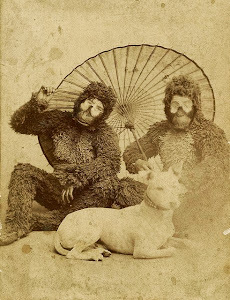 Have you performed in a traditional Beauty and Beast act with a gorilla suited counterpart? How often do you perform this act? Has your act gone through any sort of evolution over the past 4 years? My afro keeps getting Bigger and BIGGER AND BIGGER... I'm amazed at how much hair I can get under the mask... I was doing a gorilla strip in 2004 and got hired to be in the Va Va Voom Room... New York Art Director Kate Valentine added some fun stuff to it... She actually got me to try wearing my banana skirt under the gorilla suit.. something else that I thought wouldn't fit in there... she had me change my costume to be all coconut bra and grass skirt and had me use different music... after the Va Va Voom Room show was over she was cool about me adding the stuff she choreographed to it... and I changed the costume even more to include a Masai necklace and a yellow sequin samba bikini... In the UK in 2005 I bought a really cute pair of pasties from our stagehand Danny... The darling was out there picking up my sweaty gorilla suit every night and even so she made the coolest pasties that matched my micro bikini I wear under my sequin samba bikini... I freaked out and bought them immediately... 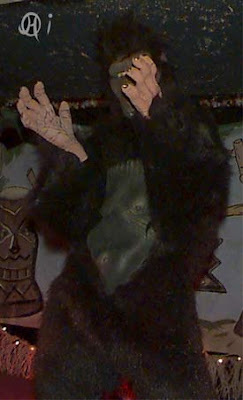 I still use Danny's pasties for my Gorilla Strip Tease today in 2007! 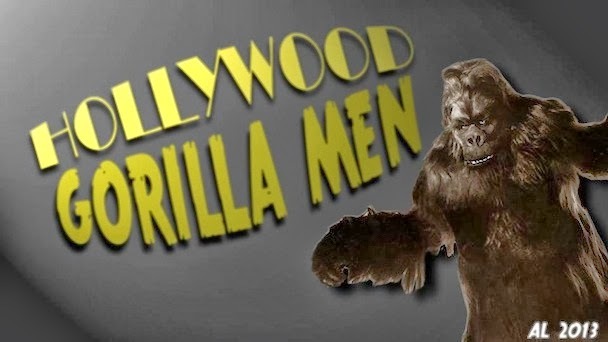 If you purchased the gorilla suit 8 years ago but began the gorilla strip 4 years ago - what were you doing the suit during the interim? 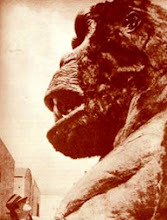 I noticed you have extensive Butoh experience; have you heard of Don Mcleod? 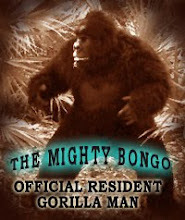 (Don is a modern Gorilla Man who was also active in Butoh until at least 2004). My thanks to Indra for taking the time to stop shaking her behind and answer a few questions. Images are also used with her permission. You can see more of Indra and her diverse and striking performances at her website TheIndra.com and also at her MySpace page.